Looks to be a great bike for the value, I wish it had the lighter wheel set but that can be fixed. Will they still make an alloy Epic hardtail is the question. Not much different from the late, lamented, Carve/Crave. Good news, because that's a great bike. Most of the geometry is the same as the Epic carbon that I own. It did drop some weight from the older alloy frames 200 grams or so. What do you think about it vs the fuse? I'm liking the idea...with a dropper and CF wheels, of course. Depends on your goal. Chisel will be must faster and lighter in good/smooth conditions. Ive seen an almost stock fuse weigh in at 28 even pretty much. The fuse in rocky rooty areas is nice and it "climbs like a billy goat" but is definitely slower in some aspects. Think the fuse is still a better choice for a big guy 280ish)? From what I hear there is no fuse expert for 2018, so if i want 1x (and I do) it's either the fuse comp at 1500 or the chisel expert at 1850, I guess. Get the one with shimano brakes lol. But honestly id say fuse in your situation. Those alloy wheels are not the Roval Control alloy wheels. So they are not lighter than the carbon wheels. This should be pretty easy to get under 20-21 lbs. I'll be ordering a frame set as soon as they come available. So what would the geo and bike be like if you replaced the fork with a 120? Could you get it a little rowdier without compromising it much? This thought crossed my mind, assuming the rear stay would fit a wider tire. Not crazy about the long-ish stem, but I could deal with that. The bike is certainly a looker. Being boost rear spacing and seeing a 2.25 inch tire in there, i would say it will definitely fit more. As I said above, I will be ordering one as soon as they come available, so when i get some boost wheels to put on it, i'll test it and post up the findings. I'm very interested in the 1x but I've never had good luck with SRAM brakes. Sure wish I could build cost effectively with a complete XT group. No good in rock gardens..
Everyone else being scared of sram brakes makes me scared of them too! i also feel the front chainring is too small but I want a Reba fork. I'm still undecided on these, the 1500 dollar rig looks to be the one to get. I like both build kits for the money, but like the allez smartwelds when they came out... they were conservative with their builds and the bike more than justified nicer parts being put on it... so i will be getting the frame and building it up a little nicer. I'm selling my 2015 Epic WC to build one of these as a new race bike. What's up with the frame only colors? I'd be interested if the red or light blue ones are available. I'm sure there will be more once they release and it starts selling... if it sells like crazy like the allez does. That's what i'm thinking, I've ridden the brain fork for a while and like it, but am not sure if i want to go with the Fox Stepcast or not. These should be available at the end of the month. I will try to get one mounted up to try it out. I know it will fit the new 2.3 specialized tires as that is what they come spec'd with. This is the perfect High School MTB bike. Alum, good spec. and geo. The frame alone is priced well. This should be a hit for Spesh. I am not sure why they would make a alloy EPIC HT if they are producing this for 18. 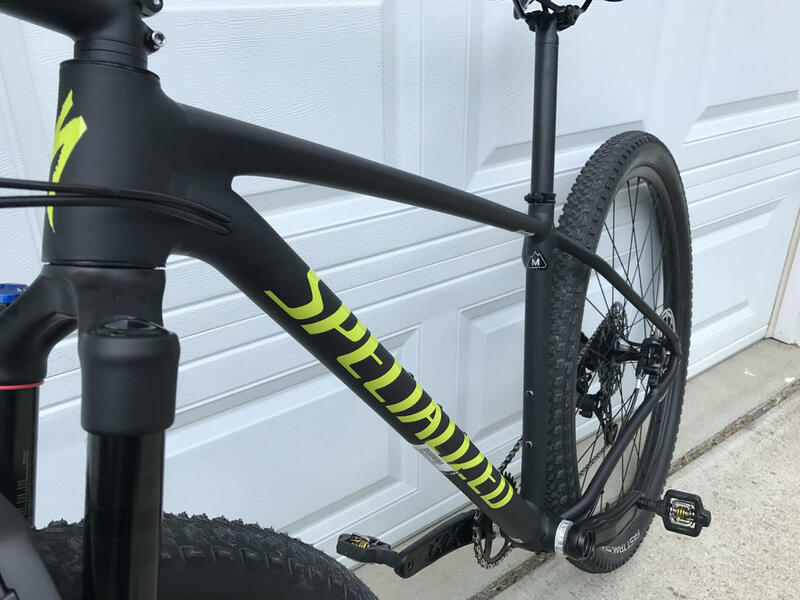 How does the carbon epic ride? Been contemplating buying a comp carbon and putting some 2.3 inch tires as a lighter option to my FS 29. Do you notice a lot of pedal strikes with the low BB? From what I understand, it seems that the Epic HT alloy is going away (as it was really just a renamed stumpjumper frame rather than a new frame) and the chisel will be taking its place. The Alloy Epic HT is not boost anyways, so i doubt they keep it around. Unless they boost it and go with an even better smartweld frame for that one... There is no reason to keep it around. I would avoid the brain fork. PITA to service and being a pretty rare item, specialized does not stock the parts for older models so in the long run you may have trouble keeping it running. Also is the new Rockshox Judy just a boost version of the 30 gold? My thoughts right now are to buy a boost reba and have the brain damper put into it. I work at a spesh dealer, so i typically sell my bikes every two years or so anyways to get new models, so keeping it for a really long time doesnt usually happen. I was debating on reba vs sid and then came up with the brain idea in a reba because between the reba and the sid the ONLY difference between them is the dampers and price. So I can snag a base line 100mm boost reba and put a brain in it and have an identical fork to one that comes on an expert carbon model of the epic or epic HT for WAY less money. And servicing them just requires sending them into specialized and being that i'll have a spare bike, that shouldn't be too much of a pain. Here are some pics of a frameset. 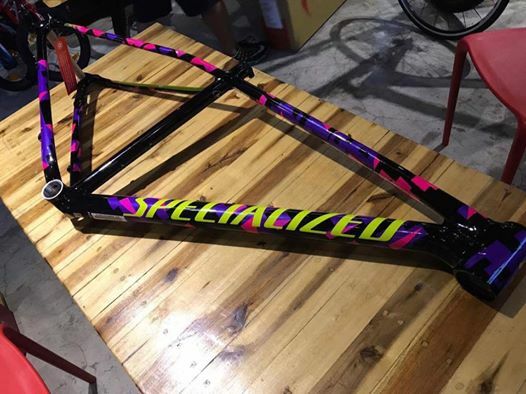 Specialized Concept store posted these. Looks way better than the stock photo. Anybody seen NX 10-42 cassette in the specs? I have contacted Specialized to confirm whether it is NX, or 10-42 and they said that website info is correct. I just looked at the frame only options; my eyesight is only just returning to normal now and I fear I may have done permanent damage. I will be picking up a Expert-1x in Medium black/Green as soon as the first shipment hits my LBS. Looks like a great bike at this pricepoint. I always liked Aluminum frames. Interesting RAFU, the NX cassette is spec'd at 10-42 on the website, but SRAM references the NX at 11-42. I believe the 1X version comes with a GX drivetrain But if they did put an NX cassette on it, the cassette is 11-42 rather than 10-42. Might just be a typo. I think they should have gone with 24-38 rather than 22-36 on the Comp chainrings. Too easy to spin out the 11-36 cassette with a 36t outer chainring. 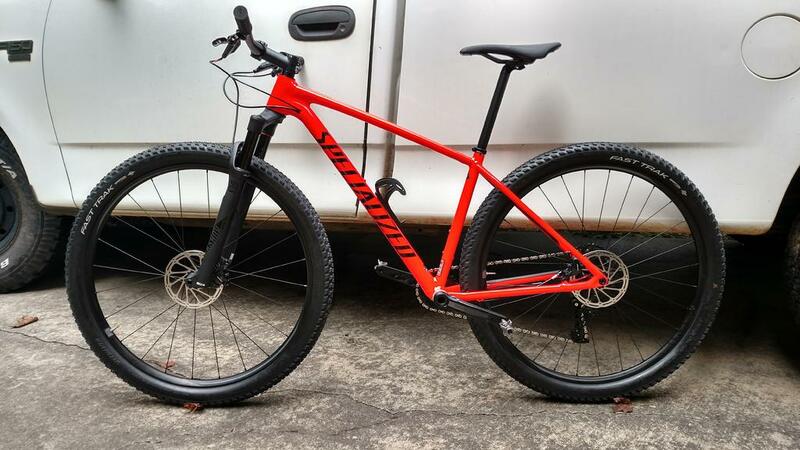 If this is a racing hardtail, which I think it is intended to be, people will be getting passed on the flats IMHO. That appears to be my only significant grind with this bike. . . . from what I know so far. Looking at you Judy. . . . . 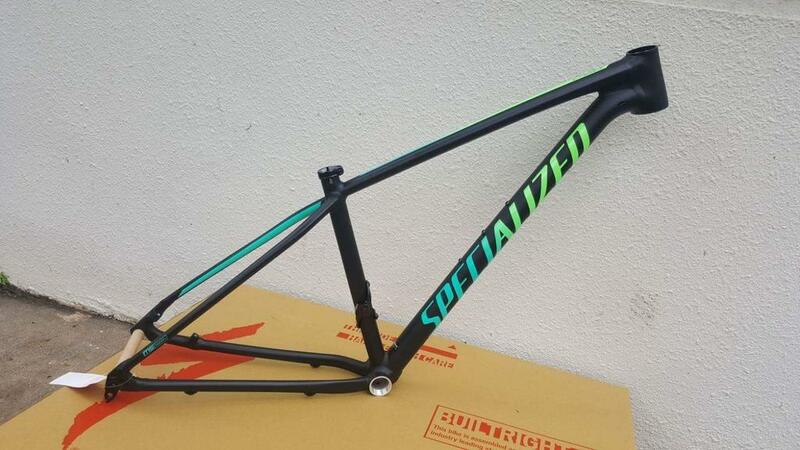 I think it is just typo too but wanted to have official confirmation from Specialized. I have 36-22 in my Superfly and it allows you to ride 40km/h with cadence 40. With 38t I would have to use granny gear more often on the climbs. I called Specialized and confirmed the Typo on the Expert-1X model with SRAM 1x11. It does indeed use a standard NX 11-42 cassette. They said they will work on fixing the website. I just got hold of a small chisel frameset. Gonna built it up light, hoping to get it below 10kg?? I think you will be way below 10kg with that setup. With a factory weight of 24.4lb, you can drop a bunch just with new wheels and going tubeless. Yeah you should be WAY under 10kg. I have parts coming in for mine right now but haven't been able to order a frame yet as they aren't available yet in the US. At least not last i checked. Haven't decided on cranks yet... trying to find some Raceface Turbine cranks, might go with aluminum X1 sram cranks... not sure yet. Thing looks pretty sweet. Thoughts on putting a 120mm fork on it and using it as a lightweight "trail" bike for rooty east coast singletrack?? (charlotte nc). Could make it light in the front end on steep climbs and steer like a dump truck. Not sure it's worth it to spend that much coin on one just to find it doesn't work well. 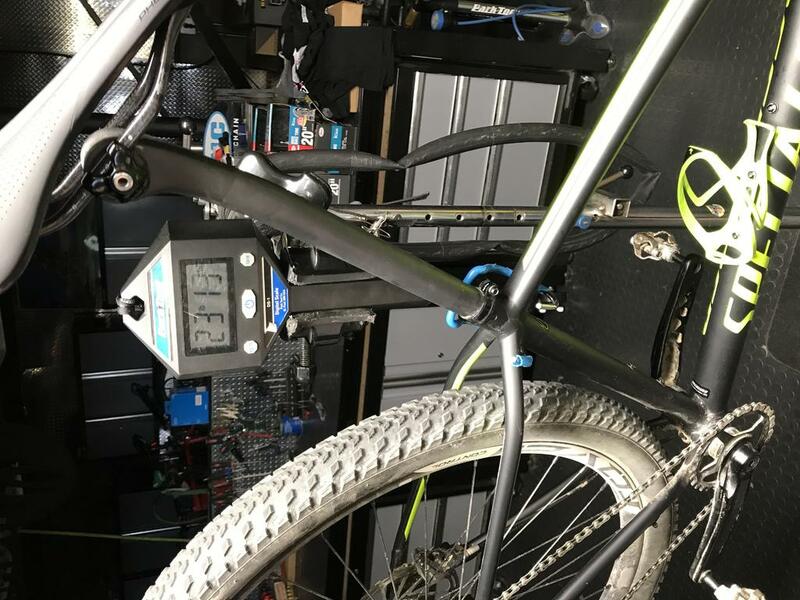 If you get a fork that can be converted from 120 to 100, and back, no harm in trying, but you may not have that 120 mm travel trail hardtail you were hoping for (if that is actually what you desire). 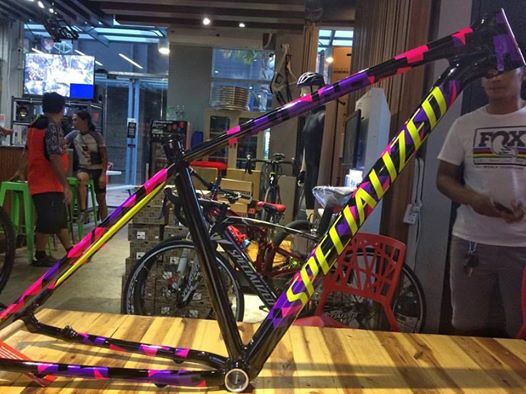 I was going for a 2016 full carbon cube frame.. Then I saw this at my local dealer andr never looked back. Rims and hubs are otw. Will post again on the final built. i bet the california fade colorway would be a tad lighter too since it's probably anodized or powder coated rather than a full on gloss paint job. I have an Allez Smartwed for my road bike and idk that i'll ever buy a carbon frame for road after riding it. At least not any time soon. I'm pumped to get my Chisel frame in and build it up. Any idea if this will fit 27.5x2.8 tires? I know my 120mm Pike will, but wondering about the frame? Did you have to use any spacers with the Raceface cranks and bb?? I ordered some raceface cranks to go on this build as well. Wondering if i'll need any spacers. They put a 3mm offset on the chainrings to accommodate Boost spacing. That way, you can change chainrings to use the same cranks on many different bikes. Yes and i dont think those hubs are able to be converted. You'd be better off getting a shimano cassette to upgrade unless you want to switch wheels altogether. Awesome! I got my cranks without a chainring, so i will order a boost chainring for them and then the raceface BB and i should be set! Looking forward to seeing more progress pics of your build! So, I assume the BB shell is 73mm? Looking to put a King BB on the Cal Fade I ordered Sunday, but they require adapters based on shell width. Are you in the US??? I've been waiting on the Cali Fade to come available for several weeks now. A complete GX would have been so much better. 42T cog is already hard for climbing around here, and now with the lack of the speed the 10T cog provides makes it so much worse. Yes, in the US. To my knowledge nothing is really "available" yet, but expected release dates start in August. I went through a sponsor shop to get one pre-ordered. Ahhhh, ok. That makes more sense. I've been checking the B2B site every chance i get, looking for them to be available... it never shows though haha. Beginning of august isn't too far off though. I agree. I was wanting the 10T for a higher top end. It feels like the GX build is really a blend of "NX Level" components with a GX derailleur and shifter thrown in. Wish they would have used a XD hub. My LBS is getting a SRAM 1x11 build in on Monday in my size. I'll probably still go grab it. I think if you swapped in some Crest MK3's with a lighter 10T-42T XD cassette you'd have a 20-22lb beast. Anxious to what joezuri's build comes out to with high end components. 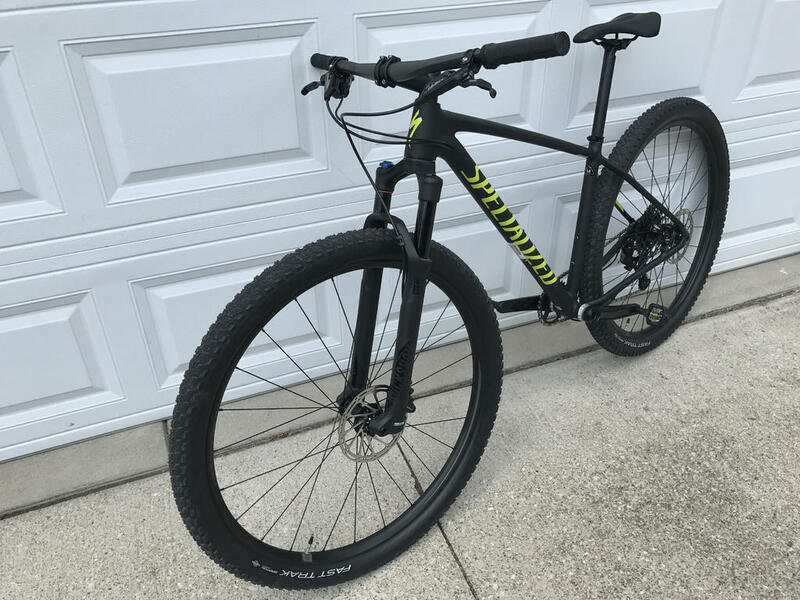 Let's hope not, I just bought a 2018 S-WORKS Epic Hardtail. I plan on getting a Chisel fairly soon. So assuming the same build on both, the chisel will only be about a pound heavier. Which is impressive, especially with how light the Epic HT is! Anxious to see how well the chisel rides. The allez smartweld is down right impressive, so hopefully they follow suit with the chisel. Wheelbase for medium is over an inch longer than Stumpjumper hardtails of the past. That will change the ride noticeably. 120mm Fox 34 is going on mine. Going for a "Hard Country" build. HT angle should end up around 69*, so no dump truck steering there. BB height, and everything else is acceptable for my style and location. My LBS is getting a couple of complete models in tomorrow i believe. I will try to go grab some pics and weights and post them up. Framesets still aren't available in anything but a large and XL in the US as of now. Well, my CA Fade is an XL....just waiting for the call to come pick it up. Should arrive soon i would think! Just picked mine up today. Took a few quick pics. I'm about as casual as riders get, so I won't have any good feedback on how the bike rides. Makes my old 26" look like a toy. What's the stem length on the bike? Awesome bike v10jon.. I like the satin finish on that one. Specialized did a great job with the cable routing. 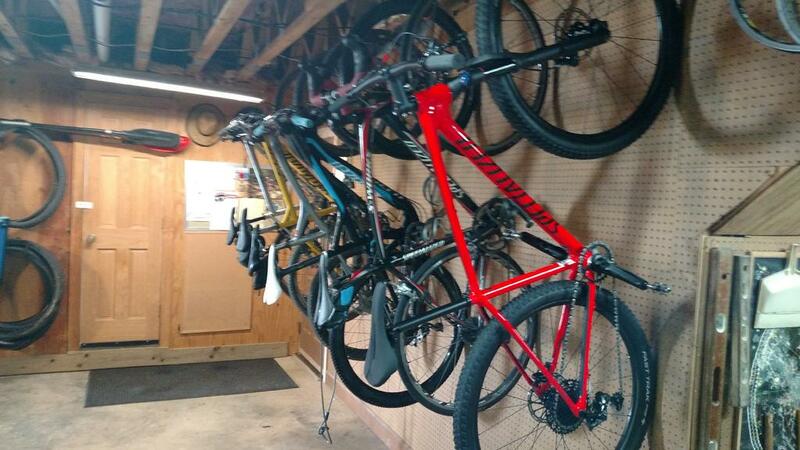 And the 29er really dwarfed that 26.. Cool thing I just found out... the womens base level chisel that shows in the US as "Gloss Black / Chameleon" actually has logos that fade from black-blue-purple, like the sworks framesets in the chameleon colorway. Last edited by Tyrich88; 08-03-2017 at 06:27 AM. I have the red one coming in Friday. Giving my 2013 ht SJ to my niece who has an S-Works 2001 SJ that she rides and races occasionally. I have a 2014 SJ Evo Expert Carbon FSR but I ride the hardtail mostly simply because it is a better workout. Contrary to others, because I get off the seat or stand a lot on the hardtail I find my lower back and abdomen are far stronger if I consistently ride the ht bike. I am faster on the FSR though and use it in a race or two each year. I like this slightly longer wheelbase and slightly relaxed head angle associated with this Chisel. Does anyone know if there is a XD Driver available for Chisel's stock hub? I havent been able to get my hands on one just yet to see. But I would assume there is not a way to convert it to XD. Probably would be a worth while investment to get a nice wheelset for it anyways. Then you can have the nice wheels set up with an XD and lighter cassette... and have a backup wheelset! Almost there, my rims just arrived and yet to be laced. 5.2kg wout chain, wheels, rotors, tyres, cassette and pedals. Rims at around 360g each, 24mm internal. Going to run tubeless with maxxis ikon maxxspeed 2.2. Anybody know if the stock rims can be set up tubeless? Yes, I have a chisel comp (U.K.) and can confirm that my stock wheels had 2bliss rim strips preinstalled. Only needed to add tubeless valves and sealant. Went on super easy, only used a track pump. 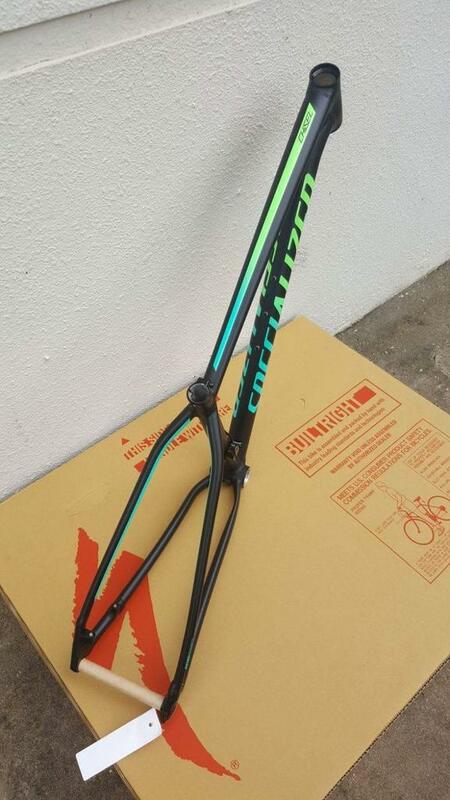 For those of you ordering framesets, i found these pictures earlier today. Helped me make my decision! So as soon as they are available in my size i'll be ordering the Cali Fade and throwing all my parts on it that have been waiting in my garage for a month. Sorry for the sideways pic. I'm having a ton of trouble using this website on my iPhone. This bike was a replacement for an '11 Stump EVO ht 1x10. It weighed 25lbs with the carbon wheels and stock cockpit components. I was surprised I shaved that with carbon bits but none the less the bike still has a lot of room to lighten up. The Cali fade is a great looking frame but I couldn't pass up the price on this and pretty much was able to swap out a lot of parts. Carbon cranks and some smaller tires could easily shed another pound or so. The bike is still not as fast as my '14 Epic WC but still a great fast ht none the less. Interesting... the one we have in our LBS is 24# in bone stock config with plastic test ride pedals. I'm shooting to get mine around 20 but hopefully less... we will see. 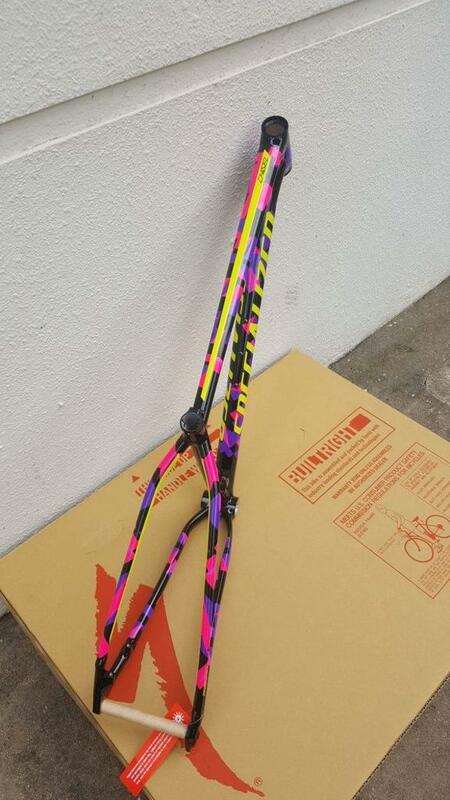 I will be ordering the cali fade, if they ever come available, and building it up with x01, carbon cockpit, control SL's and some raceface turbine cranks. Yes it is! and I will say, I just got my new Control SL's in last week and they are awesome! Can't wait to mount them up on the chisel and get to riding them! I rode a stock chisel we just got in on saturday and the thing is FAST! Pumped to get this in as an alternative to the new epic i'll be ordering here in a few months! I'm going all in on smartweld tech and building them both up decently nice. After owning the allez smartwelds i'm sold on the tech. well worth the money. Just got back from the shop. Paid for my Cali Fade frameset and they said it should ship "any day now"
So hopefully more of these will be hitting stores soon. On the brakes, i have MT8's and LOVE them! Sometimes you can find them as new takeoffs for like $150 a set which is crazy cheap. That's what i paid for mine and they were unused. As for the wheels... Roval control SL's are phenomenal if you can swing them. I haven't ridden the new ones yet, but by everything i've heard they're even better than the old ones which were pretty awesome. Yup they are. Had a few different versions of the old ones. I get a pretty decent hookup on Spesh stuff, so may have to check into the new version. I do too. 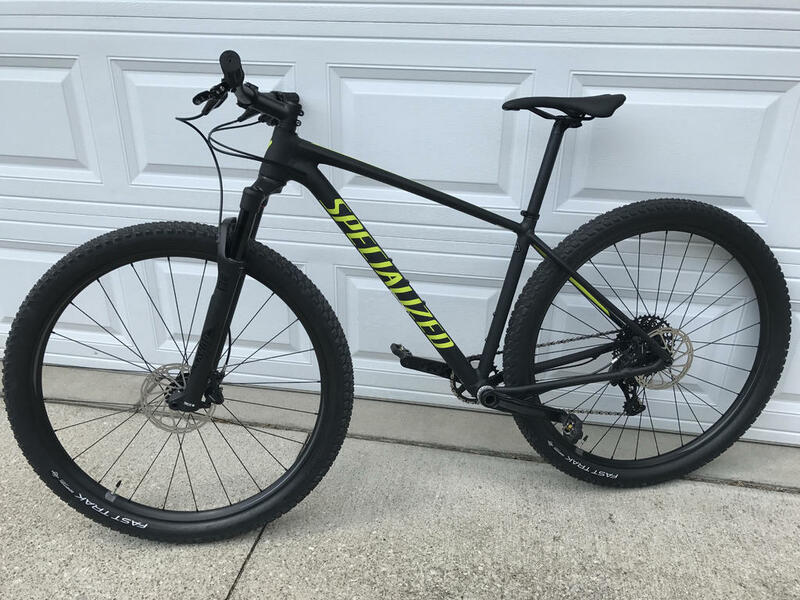 I race for a specialized dealer and help out there as needed. otherwise i wouldn't have bought them as quickly as i did haha. Really looking forward to getting this build done and seeing how it turns out. 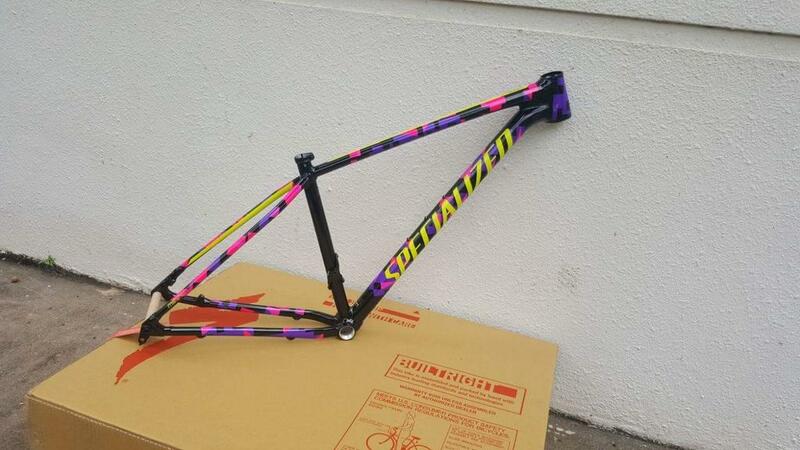 Hopefully your frame comes in soon! My red Chisel, a medium. It weighs 24 lbs 6 oz with Egg Beater pedals given 2 separate digital scales. I have it set up tubeless with lots of sealant. Wheelset isn't light but it appears extremely well built. Last edited by rakerdeal; 08-22-2017 at 03:53 AM. 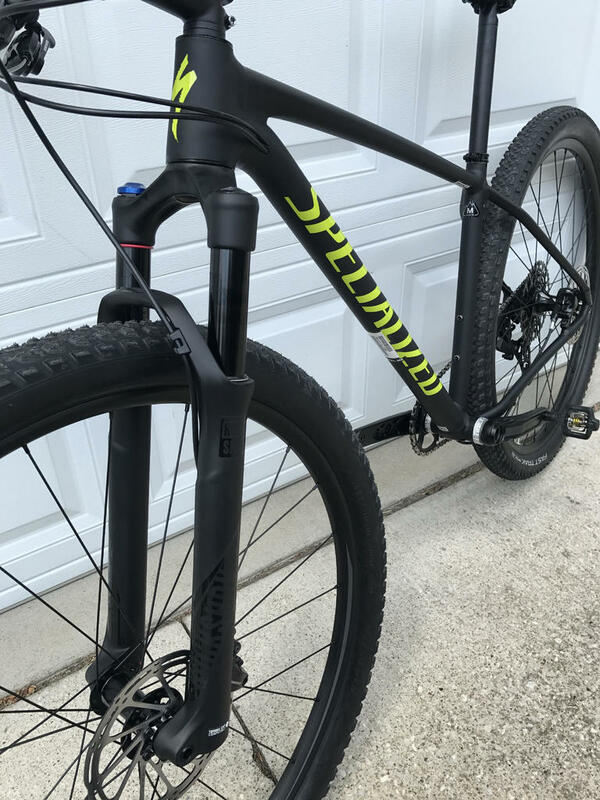 I rode my new Chisel today for the first time on a trail here and my first impression is that it rides somewhat more subdued than my previous 3 SJ hardtail 29ers. Still lively but I think the slacker head angle and slightly longer wheeelbase are noticeable. Last edited by rakerdeal; 08-08-2017 at 06:25 PM. 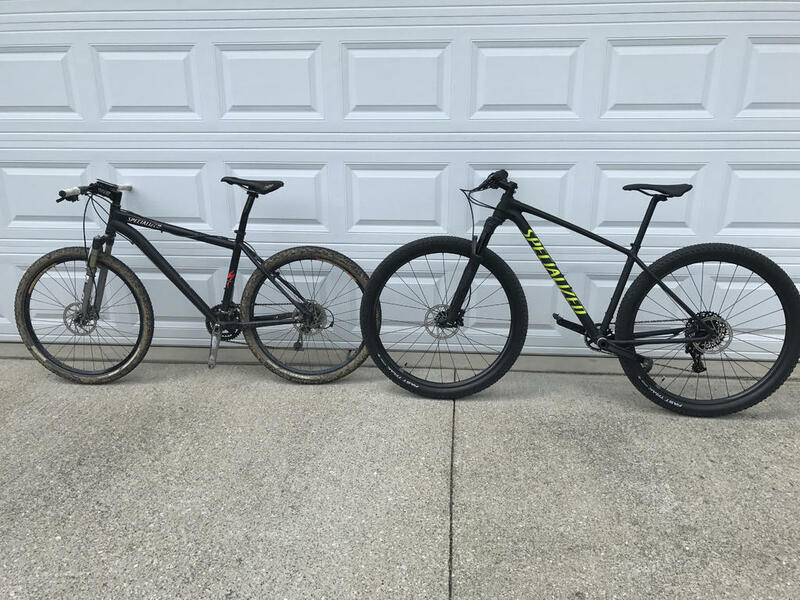 were your stumpjumpers carbon or aluminum?